Okay, so this increase isn't really called "K-Fab," but that's what the tabloids would call it if it were dating a celebrity, right? It's actually "knit into the front and back," usually abbreviated "kfb" in knitting patterns. It's a useful and easy increase, though it does have an important limitation -- it isn't "invisible" in stockinette stitch. You'll see what I mean. If you haven't done it before, give it a try! 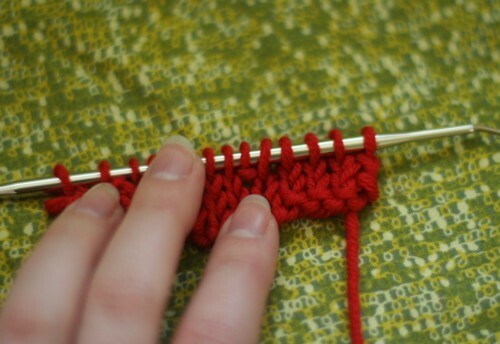 First step: knit into the stitch you're increasing into -- but don't slip the old loop off of the needle just yet. Since you haven't slipped the "old" loop off the needle yet, it's still sitting there on the left-hand needle. Bring your right-hand needle around and through the back of that same loop. The name of this increase is pretty self-explanatory, actually...but I like calling it "K-Fab" better! 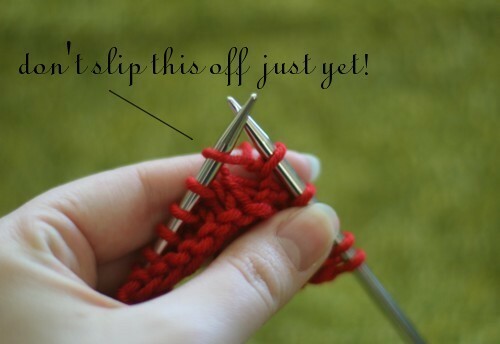 Now that you've knit through the back of the loop, you can slip it off the left-hand needle just as you normally do when you work a stitch. 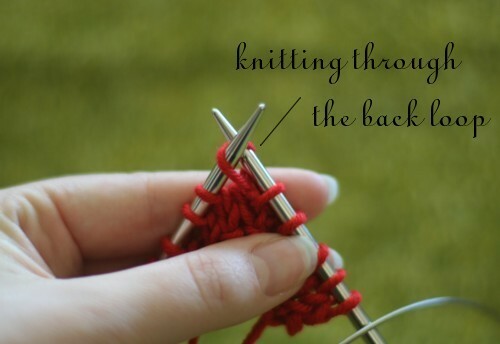 Notice that the stitch you created by knitting into the front of the loop looks like a normal knit stitch, but the stitch you created by knitting into the back looks more like a purl stitch. This is what I meant when I said that this stitch isn't "invisible" in stockinette stitch -- it looks like a purl bump, so it's noticeable. Of course, if you're working in garter stitch or any other stitch with a lot of texture, a bump like that isn't going to be nearly as noticeable. And here it is again, after the full row has been knit. There are a ton of different ways to increase, and different increases are useful for a variety of situations. 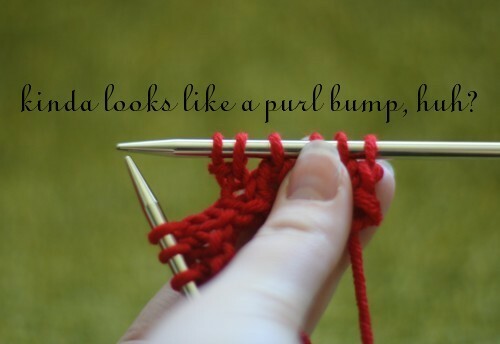 This one is easy to do, so if the "purl bump" effect doesn't matter, it's a handy one to have in your toolkit. Also keep in mind that you can increase by knitting into the front and back of the same stitch multiple times -- useful when making bobbles, ruffles, and any number of interesting stitch patterns. OMG! Can I just say THANK YOU for this? I'm learning how to knit and have read descriptions of this a million times but have never seen such clear pictures. I think I MIGHT ACTUALLY BE ABLE TO DO IT now. All I could do previously was the pick up and twist to make another loop kind of increase. This is one of my favorite increases.